I've been always meaning to do one of these lists but there's usually quite a lot of effort (one year to be in fact) involved in making a top 100 list of games, not to mention the ire you'll no doubt get from fans of a particular game if it isn't included on your list (which will no doubt happen in this case). However, a year back I noticed the top 100 list provided by the Australian Broadcasting Corporation's gaming show Good Game seemed to have many classic games missing from its list. Not only that, but most games seemed to have only been released in the past few years as well. To be fair to Bajo and Hex (the hosts of the show) they weren't responsible for coming up with this list - it was compiled by popular vote from their viewers. Also, Good Game doesn't focus solely on PC gaming - the show encompasses other platforms too. Consequently, Good Game's Top 100 is probably a better indicator of the show's audience demographics than it is a list of actual good games (I reckon the median age of Good Game's audience is around 17 years old judging by the choice of games). Anyway, I thought I could do a better job but before I started to make my own list I checked with PC Gamer to see if they had a Top 100 list. Sure enough, they do that apparently gets updated every so often and while there were more games on their list that I considered as classics (which is not really surprising considering my PC gaming bias) there were still many omissions and some games I thought that didn't deserve a spot on the Top 100. So it was up to me to set things straight, to give a proper top 100 list of PC Games. But this time, I wouldn’t be alone in my quest. This time I would have help! Since I’m such a nerd, I happen to have a list of all the PC games I can ever remember playing since the early 1980s until now. This turned out to be quite a long list numbering over 350 games. I then further refined this list to only the games I deemed worthy of a Top 100 list (after all, just because you played a game doesn’t mean it’s any good). 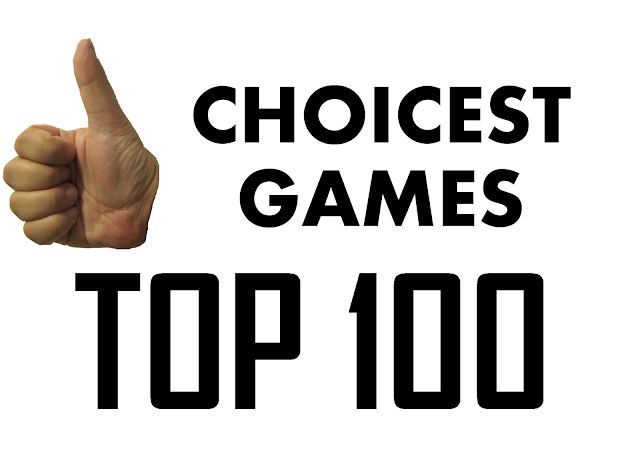 After that I decided to check out the Good Game Top 100 and PC Gamer Top 100 to check out any PC games that I missed on their respective lists and add them to the voting pool for the Choicest Games Top 100. Since I wanted the list to be more representative of all PC gamers and not just based on my PC gaming history, I decided to assemble a panel of four judges (including myself) to not only vote on which games they thought deserved to be in the top 100 list but to also add any extra games they could think of; In the end the shortlist was just shy of 500 games! 0 = Never played or played but didn’t like it. 2 = Game of the Year. Refined sequel. Revitalising genre. Great game. 3 = Genre starter. Important game with respect to PC game development. Best game ever. As you can see, with four judges that means the highest score a game could possibly get is 12/12. No games in the shortlist managed to get a perfect score or even 11/12. Only two managed to get a score of 10/12 and the cut-off to even make it onto the top 100 was about 4/12 (although there were some with that score that didn’t make the list – they however will receive an honourable mention). There were obviously several games that received a similar score so my own opinion on how important the games were influence where they ranked somewhat, although I tended to pick older games or ones more important to the industry. While there are some anomalies on the list, overall I’m pretty happy with the end –result. I think I also managed to grab a bunch of judges with a good mix of genre preferences along with them playing during different eras of PC gaming. Mark founded the blog Choicest Games in 2008 and has been playing PC games since the 1980s. He has an eclectic taste in games but his favourite genres include point ‘n’ click adventures, First Person Shooters and almost anything to do with sci-fi. He is also leader of the social guild/clan Gamers of Choice. Lanna is Mark G’s wife and being the supportive wife that she is has contributed reviews and her input on the running of the blog. While she did play a lot of older PC games when younger, she’s only a recent convert to modern PC gaming thanks mainly to her husband’s influence (“Sorry!” – Mark G). Lanna enjoys puzzle games, the Battlefield series and Civilization. She was also at one stage world champion at Everyday Genius Squarelogic. Choona is a contributor for Choicest Games and has been playing PC games since the late 1980s. Choona enjoys playing basketball games, First Person Shooters and MMORPGs. Luke is another contributor for Choicest Games and has been playing PC games since the 1990s. Luke mainly enjoys Real-Time Strategy games, First Person Shooters and RPGs.